The bodywork consists of an ashwood frame on which the bodyshell from bent sheetmetal is fixed by nails. 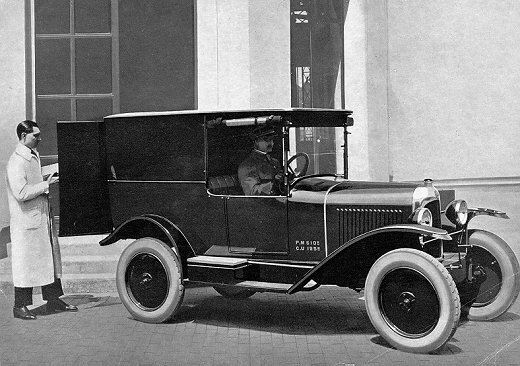 The van body was covered by a fixed roof which was covered by fabric and supported by the windshield columns. The car's front corresponds to the Cloverleaf. The car had two single seats covered by skai. The drivers seat was fixed, the passenger seat could be removed. The stiff part of the roof begins above the seats. The interior side panels were provided with pockets. The floor was covered by a rubber mat. The dashboard is from black enamelled sheetmetal and bears the usual instruments. The handrails are made from black painted aluminium. The windshield is horizontally split, the upper part can be pivoted. The van was provided with a twin rear door. In the front of the load compartment there was a small gliding door on the bottom, which allowed to transport objects up to 1,50m length. The interior size of the load compartment was: length 0,75m, width 1.07m, height from floorpanel 1.02m. The max. load is 125kgs. The car has only one door which is either on the drivers or on the passengers side (probably available upon customers desire) and which opens to the front. A tensioned conical bolt reduced undesired vibrations on the door. The doorhinges were fitted invisibly. The spare wheel was fitted on the opposite side, inside out, and fitted with a tyre upon delivery. The running boards are made from black enamelled aluminium, reinforced by polished longitudinal ribs. Mudguards and frame cover are made from black enamelled sheet metal. All four mudguards are reinforced by bordures. The headlamps are adjustable by a nickel plated connecting rod. Apart from normal road light there is also the possibility to switch on a parking light. The panel delivery van is basing on a chassis C3 with a wheelbase of 2.35m. The running board from alumnium measures 170x980mm. On both sides there are curtains from waterresistant fabric fitted, the one on the door opens together with it. 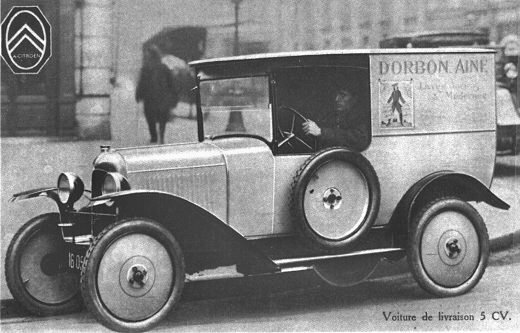 In the beginning the panel delivery van was furbished with high-pressure tyres (700x80). From June 1924 on all cars were equipped with low-pressure tyres "Michelin Confort" (balloon tyres) and the corresponding rims. The wheel dimensions are now 715x115 (balloon). The cooling system was improved by a ventilator from 1. June 1925 on. The panel delivery van was delivered from the factory only in brown (havane). Rims, mudguards etc. are black. Black enamel mudguards, frame cover, rims, windshield frame, windshield columns, License plate, cover rail.